Nissan and EVgo electrified I-95 between Boston and Washington D.C.
Nine stations with a total of 52 fast chargers were installed across I-95 to enable the 500-mile journey from Boston to Washington D.C. The project was conducted by Nissan and EVgo, which expanded its charging network beyond 1,000 fast chargers in total. The Northeast fast charging corridor “I-95 Fast Charging ARC” currently offers 50 kW DC fast chargers with CHAdeMO and Combined Charging System (CCS) plugs, but stations were pre-wired for higher charging outputs to allow easy upgrading to 150 kW fast chargers in the future. At least four chargers are available at each station. “Nissan remains the global leader in EV sales, and its “Infrastructure for All” initiative has played a crucial role in the development of the I-95 Fast Charging ARC. As part of this inclusivity initiative, all charging stations feature both CHAdeMO and Combined Charging System (CCS) fast charging outlets providing access to all EVs available today with fast charging capability. Owners of Nissan LEAFs can charge their vehicles up to 80 percent in only 30 to 40 minutes when using one of the DC outlets. As part of Nissan’s “No Charge to Charge” program**, owners of Nissan LEAF models can charge their vehicle for up to 30 minutes complimentary charging at any participating DC fast-charge station. LEAF owners are eligible for this program for two years following their time of vehicle purchase. “No Charge to Charge” covers 55 markets nationwide, making it accessible to 93 percent of LEAF sales. Additionally, Nissan has spent over $60 million on EV infrastructure, resulting in the average LEAF driver being within 10 minutes’drive to a fast charge site. Nissan and EVgo open ‘I-95 Fast Charging ARC’ connecting EV Drivers between Boston and Washington D.C.
27 Comments on "Nissan and EVgo Open I-95 Fast Charging ARC"
I made a trip last July from MD to CT driving up I-95. There were exactly 1 set of fast chargers available for each direction (North/South, colocated at Supercharger sites on the NJTP) to enable my journey. Good to see that there are now several more fast charging locations on the route now. yes, remains. For now. Note that it says “global”. They’ve been the leader pretty much since they introduced the Leaf, although the Model 3 will change that shortly. This is a great start! I’m glad to see Nissan and EVGo teaming up like this. Nissan and EVGo also installed a bunch of single units throughout New England. I’d really like to see more of the 4+ stall locations, and preferably at 150kW. I really wish they would stop installing the lame “50 kW/100A” fast charging stations that can’t actually charge any EV anywhere near 50 kW. Give me 150 kW stations please. Agreed, 50kW, even when you can actually get 50kW, is too slow for charging on a trip and not suitable for charging overnight so pretty much not what people need. Me too. 100A maxes out at 37kW on my Bolt. Fortunately most of the EVGo’s in New England are actually 125A. That 25% boost in charging speed can make a huge difference! I-95 in the northeast corridor has had good fast charging coverage for ages. I want to see when I-80 between Nevada and Wyoming becomes covered so coast-to-coast trips become possible. Electrify America will cover I-80 from coast to coast by next summer. I doubt EVGo has plans to do so in the near future. EVGo has to actually worry about being profitable, not just paying off a fine! Electrify America does not even has a clear location for the I-80 corridor chargers, specially along the EV desert in the mid-west. If they could at least show how is that progressing in more detail I would be less worried about the feasibility of this deadline. @Gabriel Apparently that was true only for ChDeMo. CCS, not so much till now. See the comments above. Besides, a multi-“pump” station is very different from a single or even dual one. I like “infrastructure for all”. Using a standard connector gives access to EV drivers regardless of what make they drive. Agreed. And of all of those investing in infrastructure, there is only one who is building a proprietary network rather than “infrastructure for all” in 2018. I don’t think that the fact that there are different charging standards are affecting so much the ev adoption. The extra cost of adding an extra connector counts very little towards that end cost of a charging station. It is certainly much less than supporting 89 gas in gas stations. It is even good since this can lead to competition between standards. CHAdeMO is the only that has cars that support V2G and this helped to push V2G in the CCS standard (although no car support it yet). Honestly EVgo has not built that many chargers along Interstate 95 or in that city. What also notice is Electrify America has had cases were 20 new charges will pop up on the map in a week but EVgo only has one or two in maybe six weeks or ten weeks. Evgo also talks about how they are adding more CEO’s and other stuff to operate their network. They really should build new chargers most of all. As I mentioned above, it’s not fair to compare EVGo’s progress with Electrify America. EVGo is trying to operate as an (eventually) profitable company. They team up with Nissan, BMW, governments, etc. to fund their chargers. EA has a bucket of $1.2B thanks to the diesel gate fines. No need to raise capital on the hopes of future profitability – they already have the cash on hand. It is hard to see how EV charging as a stand-alone business could ever be profitable, since well over 90% of charging happens at home or work. This is not like gas stations, the “central fuel depot” model doesn’t really work for EVs. Tesla gets it, they treat the super charger network almost like an advertising expense, and probably get far getter return on investment from it that they would get from actual TV ads or whatever. I suspect Tesla’s super chargers are far more cost-effective than the competition. No screens on the chargers, just in your car, no credit card readers or anything similar, it is all designed as an integrated system from the start. Everyone else is trying to graft the “square peg” of the central-fuel-depot model into the “round hole” of the EV world. No seeing the differences is bound to lose money, it seems to me. Interesting they used blue stripes and signage. That’s usually ADA, handicap. May keep people from parking there and blocking the chargers. The EVGo units they show in southwest CT are currently broken, and that pretty much their default state lately. Deploying chargers is great, but they need to be reliable and fixed within hours when they break. VW is only going to view it infrastructure for them and has mo real tie to keep them maintained. GM, Ford, Nissan etc… has no financial interest as seen by all the DCFC stations they built. EVgo is privately funded hoping to eventually make money and has no dependent product that needs it. So if times go bad maintenance will suffer. Tesla has a vested interest because they jave a dependent product for it. This mandates a high priority for maintenance. This is why Tesla will dominate for quite a long time. So here I am with I-95 within earshot of my front steps, saying to myself “I’ll believe it when I see it”. Are the chargers at Maryland house on I 95 fast chargers? That’s kinda common stop for me for a 30 minute break in my 18 wheeler. I know they have Tesla chargers on one side and two different types opposite of the Tesla parking spots. They are close to the entrance of the building. I always see cars there charging whenever Im there walking by to go to the building. 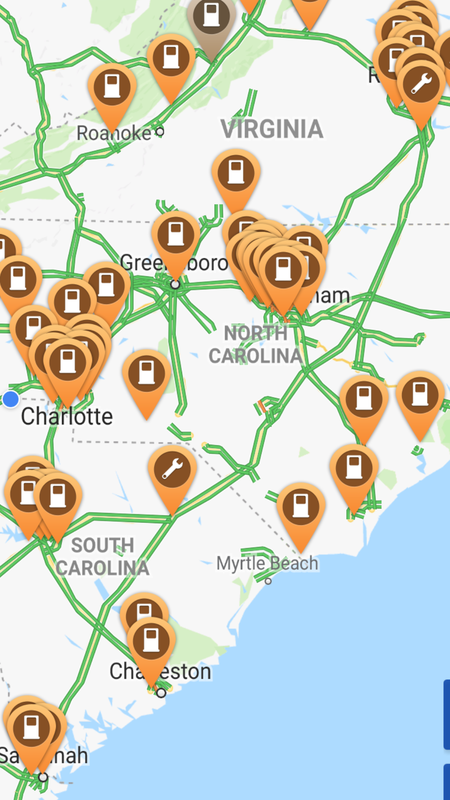 Meanwhile, there’s not a single functional CCS fast charger, for over 400 miles on I-95, between Richmond, VA and Savannah, GA….